After breakfast, start the journey to Sarchu via Rohtang Pass (3978 m), Keylong (3350 m) & Baralacha Pass (4890 m). Overnight stop at Sarchu (The border of Himachal & Jammu-Kashmir). After breakfast, proceed to Tsomoriri via Nakeela, Lachangla Pass (16,617 feet) & Skyangchu Thang (Biggest & Highest plateau in the world of around 42 km) and Pang. Admire the beautiful scenic journey on the Manali Leh Highway (Considered to be the most beautiful world in the world). Cross the Tanglangla Pass and reach Tsomoriri in the evening. Overnight stay in Tsomoriri. After an early breakfast, visit Korzok Monastery and proceed to Leh via Mahe Bridge. En route, visit Chumthang hot water springs and travel through the scenic Indus Valley. Overnight stay in Leh. After an early breakfast, visit sightseeing places like Shey, Thiksey, Hemis and Sindhu Ghat and then proceed to Pangong via Changla Pass (17,586 feet) and the third highest pass of the world. 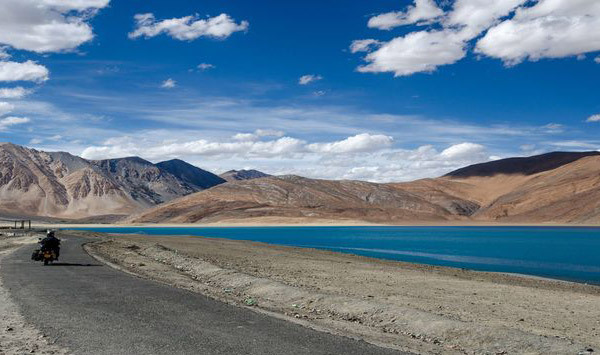 Pangong Lake is a salt water body of 120 km in length and 6 – 7 Km broad at the longest point. It is bisected by the international border between India & China (2/3 of the lake is in China’s possession). Visit the exact location of the famous movie “Three idiots” & enjoy outing along the banks of the lake. One really feels very close to nature at Pangong Lake with its scenic surroundings. On a clear sunny day, you can see seven colour formations in the crystal clear salt water lake. Overnight stay in Pangong. After breakfast, visit Sumoor & Hunder Villages and monasteries take a stroll around the place to see the life style of people living at the northernmost region of India. Drive back to leh via Khardungla pass. Overnight Stay In Leh.